Hartlepool Rovers RFC (red/black/white) v Acklam (green/black) at The Friarage, Hartlepool, on Saturday. Hartlepool Rovers’ season is at a crossroads after a 43-17 hammering at the hands of Acklam at the Friarage on Saturday. The Whites were unrecognisable from the team that had looked good for a result at Barnard Castle last time out and, once again, were undone by a team determined to run the ball at them, challenging the home defence to tackle or concede tries. The defensive steel just wasn’t there in the strength necessary to win a game and offensively Rovers were hindered by a lack of possession and quality of ball. The penalty count was, once more, a major hindrance, halting many a move; giving the visitors a better field position or, quite simply, just handing the ball and initiative back to Acklam. The defeat sent Rovers down to 10th place in the Durham Northumberland One table and all of a sudden they are looking at the bottom four instead of the top four. 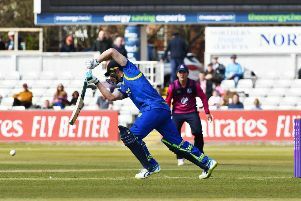 Things aren’t set to get any easier with a trip to high-flying Durham City next up and Rovers will need to raise their game several levels to avoid potential humiliation at Hollow Drift. Rovers need to urgently look at several areas: fitness has to be better through greater training numbers; tackling has to improve, there were too many high tackles and bouncing off tackles and there has to be collective 100% effort from all 18 players over every 80 minutes, the standard of this league demands it and their game management, woeful on Saturday, has to be on the money. Ryan Foreman badly missed with a second minute 48 metre penalty after which Acklam’s running game took over keeping Rovers penned in their own 22. Acklam took a 5-0 lead when a sequence of scrums heaped the pressure on Rovers and from a scrum they handled well for Tom Hughes to cross in the Railway Corner and further sustained pressure saw Ricky Scott touchdown, Sudron’s touchline conversion making the lead 12-0. It was a sobering thought that both scores had come with Acklam a man down and two minutes later the visitors, back to parity, scored again when Tim Savage’s rampaging run saw Brad Gator have the presence to touchdown at the foot of the left post. Sudron added the extra points and Rovers were staring down the barrel at 19-0 down. A rare visit to the Acklam half brought a much-needed try for Rovers; Foreman’s through kick being well taken by Adam Smith under some pressure on the line. A superb break out of defence by Jack Gunn and Joe Little set up Patrick O’Callaghan whose ‘scoring’ pass just eluded Stephen Railton, but Rovers stayed within close range of the away line and were rewarded on half-time when Joe Little powered over from a tap penalty, Chris Sainty’s conversion cutting the deficit to 19-12. Acklam appeared rattled and had an animated half time huddle and the Friaragemen hit again to pull back to 19-17 when Andrew Dring and Tom Stead combined to put Stephen Barnfield in. Sudron kept the scoreboard ticking over with a 17 metre penalty for a 22-17 lead. O’Callaghan pulled off a try-saving tackle after 62 minutes, but it was a temporary stay of execution with a knock-on and slack defence allowing Scott to run up the right wing to not only make the line, but also be allowed to run behind the posts for Sudron to easily convert. Trailing 29-17, the White Shirts needed a score, and quickly, but on 70 minutes it was the visitors who extended their lead to 36-17 from a five metre penalty. Rovers looked to have held out under severe pressure, but a recycled ball saw Ben Pearson burrow over, Sudron adding another touchline conversion. On time, Little put in a storming run into the Acklam 22, but another penalty Rovers sent quickly back into their 22 where their abject afternoon was complete when Josh Abraham took advantage of a stretched defence to touchdown, Sudron’s conversion bringing the final whistle. “We were absolutely shocking today,” said player-coach Steve Smith afterwards. “Our tackling was woeful and we missed far too many and this put us under immediate pressure and which was reflected at the breakdowns.